Not to be confused with Natural gas processing or Liquefied petroleum gas. The liquefaction process involves removal of certain components, such as dust, acid gases, helium, water, and heavy hydrocarbons, which could cause difficulty downstream. The natural gas is then condensed into a liquid at close to atmospheric pressure (maximum transport pressure set at around 25 kPa (4 psi)) by cooling it to approximately −162 °C (−260 °F). LNG achieves a higher reduction in volume than compressed natural gas (CNG) so that the /volumetric/ energy density of LNG is 2.4 times greater than that of CNG or 60 percent of that of diesel fuel. This makes LNG cost efficient to transport over long distances where pipelines do not exist. Specially designed cryogenic sea vessels (LNG carriers) or cryogenic road tankers are used for its transport. LNG is principally used for transporting natural gas to markets, where it is regasified and distributed as pipeline natural gas. It can be used in natural gas vehicles, although it is more common to design vehicles to use compressed natural gas. Its relatively high cost of production and the need to store it in expensive cryogenic tanks have hindered widespread commercial use. The heating value depends on the source of gas that is used and the process that is used to liquefy the gas. The range of heating value can span +/- 10 to 15 percent. A typical value of the higher heating value of LNG is approximately 50 MJ/kg or 21,500 Btu/lb. A typical value of the lower heating value of LNG is 45 MJ/kg or 19,350 BTU/lb. For the purpose of comparison of different fuels the heating value may be expressed in terms of energy per volume which is known as the energy density expressed in MJ/liter. The density of LNG is roughly 0.41 kg/liter to 0.5 kg/liter, depending on temperature, pressure, and composition, compared to water at 1.0 kg/liter. Using the median value of 0.45 kg/liter, the typical energy density values are 22.5 MJ/liter (based on higher heating value) or 20.3 MJ/liter (based on lower heating value). The (volume-based) energy density of LNG is approximately 2.4 times greater than that of CNG which makes it economical to transport natural gas by ship in the form of LNG. The energy density of LNG is comparable to propane and ethanol but is only 60 percent that of diesel and 70 percent that of gasoline. The natural gas fed into the LNG plant will be treated to remove water, hydrogen sulfide, carbon dioxide and other components that will freeze (e.g., benzene) under the low temperatures needed for storage or be destructive to the liquefaction facility. LNG typically contains more than 90 percent methane. It also contains small amounts of ethane, propane, butane, some heavier alkanes, and nitrogen. The purification process can be designed to give almost 100 percent methane. One of the risks of LNG is a rapid phase transition explosion (RPT), which occurs when cold LNG comes into contact with water. The most important infrastructure needed for LNG production and transportation is an LNG plant consisting of one or more LNG trains, each of which is an independent unit for gas liquefaction. The largest LNG train now in operation is in Qatar. Until recently it was the Train 4 of Atlantic LNG in Trinidad and Tobago with a production capacity of 5.2 million metric ton per annum (mmtpa), followed by the SEGAS LNG plant in Egypt with a capacity of 5 mmtpa. The Qatargas II plant has a production capacity of 7.8 mmtpa for each of its two trains. LNG is loaded onto ships and delivered to a regasification terminal, where the LNG is allowed to expand and reconvert into gas. Regasification terminals are usually connected to a storage and pipeline distribution network to distribute natural gas to local distribution companies (LDCs) or independent power plants (IPPs). Information for the following table is derived in part from publication by the U.S. Energy Information Administration. The LNG industry developed slowly during the second half of the last century because most LNG plants are located in remote areas not served by pipelines, and because of the large costs to treat and transport LNG. Constructing an LNG plant costs at least $1.5 billion per 1 mmtpa capacity, a receiving terminal costs $1 billion per 1 bcf/day throughput capacity and LNG vessels cost $200 million–$300 million. In the early 2000s, prices for constructing LNG plants, receiving terminals and vessels fell as new technologies emerged and more players invested in liquefaction and regasification. This tended to make LNG more competitive as a means of energy distribution, but increasing material costs and demand for construction contractors have put upward pressure on prices in the last few years. The standard price for a 125,000 cubic meter LNG vessel built in European and Japanese shipyards used to be USD 250 million. When Korean and Chinese shipyards entered the race, increased competition reduced profit margins and improved efficiency—reducing costs by 60 percent. Costs in US dollars also declined due to the devaluation of the currencies of the world's largest shipbuilders: the Japanese yen and Korean won. Since 2004, the large number of orders increased demand for shipyard slots, raising their price and increasing ship costs. The per-ton construction cost of an LNG liquefaction plant fell steadily from the 1970s through the 1990s. The cost reduced by approximately 35 percent. However, recently the cost of building liquefaction and regasification terminals doubled due to increased cost of materials and a shortage of skilled labor, professional engineers, designers, managers and other white-collar professionals. Due to energy shortage concerns, many new LNG terminals are being contemplated in the United States. Concerns about the safety of such facilities created controversy in some regions where they were proposed. One such location is in the Long Island Sound between Connecticut and Long Island. Broadwater Energy, an effort of TransCanada Corp. and Shell, wishes to build an LNG terminal in the sound on the New York side. Local politicians including the Suffolk County Executive raised questions about the terminal. In 2005, New York Senators Chuck Schumer and Hillary Clinton also announced their opposition to the project. Several terminal proposals along the coast of Maine were also met with high levels of resistance and questions. On Sep. 13, the U.S. Department of Energy approved Dominion Cove Point's application to export up to 770 million cubic feet per day of LNG to countries that do not have a free trade agreement with the U.S. Another LNG terminal is currently proposed for Elba Island, Ga. Plans for three LNG export terminals in the U.S. Gulf Coast region have also received conditional Federal approval. In Canada, an LNG export terminal is under construction near Guysborough, Nova Scotia. In the commercial development of an LNG value chain, LNG suppliers first confirm sales to the downstream buyers and then sign long-term contracts (typically 20–25 years) with strict terms and structures for gas pricing. Only when the customers are confirmed and the development of a greenfield project deemed economically feasible, could the sponsors of an LNG project invest in their development and operation. Thus, the LNG liquefaction business has been limited to players with strong financial and political resources. Major international oil companies (IOCs) such as ExxonMobil, Royal Dutch Shell, BP, BG Group, Chevron, and national oil companies (NOCs) such as Pertamina and Petronas are active players. LNG is shipped around the world in specially constructed seagoing vessels. The trade of LNG is completed by signing an SPA (sale and purchase agreement) between a supplier and receiving terminal, and by signing a GSA (gas sale agreement) between a receiving terminal and end-users. Most of the contract terms used to be DES or ex ship, holding the seller responsible for the transport of the gas. With low shipbuilding costs, and the buyers preferring to ensure reliable and stable supply, however, contract with the term of FOB increased. Under such term, the buyer, who often owns a vessel or signs a long-term charter agreement with independent carriers, is responsible for the transport. LNG purchasing agreements used to be for a long term with relatively little flexibility both in price and volume. If the annual contract quantity is confirmed, the buyer is obliged to take and pay for the product, or pay for it even if not taken, in what is referred to as the obligation of take-or-pay contract (TOP). In the mid-1990s, LNG was a buyer's market. At the request of buyers, the SPAs began to adopt some flexibilities on volume and price. The buyers had more upward and downward flexibilities in TOP, and short-term SPAs less than 16 years came into effect. At the same time, alternative destinations for cargo and arbitrage were also allowed. By the turn of the 21st century, the market was again in favor of sellers. However, sellers have become more sophisticated and are now proposing sharing of arbitrage opportunities and moving away from S-curve pricing. There has been much discussion regarding the creation of an "OGEC" as a natural gas equivalent of OPEC. Russia and Qatar, countries with the largest and the third largest natural gas reserves in the world, have finally supported such move. Until 2003, LNG prices have closely followed oil prices. Since then, LNG prices in Europe and Japan have been lower than oil prices, although the link between LNG and oil is still strong. In contrast, prices in the US and the UK have recently skyrocketed, then fallen as a result of changes in supply and storage. In late 1990s and in early 2000s, the market shifted for buyers, but since 2003 and 2004, it has been a strong seller's market, with net-back as the best estimation for prices.. The current surge in unconventional oil and gas in the U.S. has resulted in lower gas prices in the U.S. This has led to discussions in Asia' oil linked gas markets to import gas based on Henry Hub index. Pacific Energy Summit Working Papers]<http://nbr.org/research/activity.aspx?id=305#.UZD6pitARpE>. Recent high level conference in Vancouver, the Pacific Energy Summit 2013 Pacific Energy Summit 2013 convened policy makers and experts from Asia and the U.S. to discuss LNG trade relations between these regions. Receiving terminals exist in about 18 countries, including India, Japan, Korea, Taiwan, China, Greece, Belgium, Spain, Italy, France, the UK, the US, Chile, and the Dominican Republic, among others. Plans exist for Argentina, Brazil, Uruguay, Canada, Ukraine and others to also construct new receiving (gasification) terminals. In 1970, global LNG trade was of 3 billion cubic metres (bcm). In 2011, it was 331 bcm. In 2004, LNG accounted for 7 percent of the world’s natural gas demand. The global trade in LNG, which has increased at a rate of 7.4 percent per year over the decade from 1995 to 2005, is expected to continue to grow substantially. LNG trade is expected to increase at 6.7 percent per year from 2005 to 2020. Until the mid-1990s, LNG demand was heavily concentrated in Northeast Asia: Japan, Korea and Taiwan. At the same time, Pacific Basin supplies dominated world LNG trade. The world-wide interest in using natural gas-fired combined cycle generating units for electric power generation, coupled with the inability of North American and North Sea natural gas supplies to meet the growing demand, substantially broadened the regional markets for LNG. It also brought new Atlantic Basin and Middle East suppliers into the trade. In 2006, Qatar became the world's biggest exporter of LNG. As of 2012, Qatar is the source of 25 percent of the world's LNG exports. Investments in U.S. export facilities were increasing by 2013—such as the plant being built in Hackberry, Louisiana by Sempra Energy. These investments were spurred by increasing shale gas production in the United States and a large price differential between natural gas prices in the U.S. and those in Europe and Asia. However, general exports had not yet been authorized by the United States Department of Energy because the United States had only recently moved from an importer to self-sufficiency status. When U.S. exports are authorized, large demand for LNG in Asia was expected to mitigate price decreases due to increased supplies from the U.S. In 1964, the UK and France made the first LNG trade, buying gas from Algeria, witnessing a new era of energy. Today, only 19 countries export LNG. Compared with the crude oil market, the natural gas market is about 60 percent of the crude oil market (measured on a heat equivalent basis), of which LNG forms a small but rapidly growing part. Much of this growth is driven by the need for clean fuel and some substitution effect due to the high price of oil (primarily in the heating and electricity generation sectors). Japan, South Korea, Spain, France, Italy and Taiwan import large volumes of LNG due to their shortage of energy. In 2005, Japan imported 58.6 million tons of LNG, representing some 30 percent of the LNG trade around the world that year. Also in 2005, South Korea imported 22.1 million tons, and in 2004 Taiwan imported 6.8 million tons. These three major buyers purchase approximately two-thirds of the world's LNG demand. 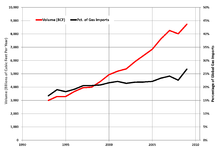 In addition, Spain imported some 8.2 mmtpa in 2006, making it the third largest importer. France also imported similar quantities as Spain. Following the Fukushima Daiichi nuclear disaster in March 2011 Japan became a major importer accounting for one third of the total. European LNG imports fell by 30 percent in 2012, and are expected to fall further by 24 percent in 2013, as South American and Asian importers pay more. Based on the LNG SPAs, LNG is destined for pre-agreed destinations, and diversion of that LNG is not allowed. However if Seller and Buyer make a mutual agreement, then the diversion of the cargo is permitted—subject to sharing the additional profit created by such a diversion. In the European Union and some other jurisdictions, it is not permitted to apply the profit-sharing clause in LNG SPAs. For an extended period of time, design improvements in liquefaction plants and tankers had the effect of reducing costs. In the 1980s, the cost of building an LNG liquefaction plant cost $350 per tpa (tonne per year). In 2000s, it was $200/tpa. In 2012, the costs can go as high as $1,000/tpa, partly due to the increase in the price of steel. As recently as 2003, it was common to assume that this was a “learning curve” effect and would continue into the future. But this perception of steadily falling costs for LNG has been dashed in the last several years. The construction cost of greenfield LNG projects started to skyrocket from 2004 afterward and has increased from about $400 per ton per year of capacity to $1,000 per ton per year of capacity in 2008. Low availability of EPC contractors as result of extraordinary high level of ongoing petroleum projects world wide. High raw material prices as result of surge in demand for raw materials. Lack of skilled and experienced workforce in LNG industry. The 2007–2008 global financial crisis caused a general decline in raw material and equipment prices, which somewhat lessened the construction cost of LNG plants. However, by 2012 this was more than offset by increasing demand for materials and labor for the LNG market. Small-scale liquefaction plants are advantageous because their compact size enables the production of LNG close to the location where it will be used. This proximity decreases transportation and LNG product costs for consumers. It also avoids the additional greenhouse gas emissions generated during long transportation. The small-scale LNG plant also allows localized peakshaving to occur—balancing the availability of natural gas during high and low periods of demand. It also makes it possible for communities without access to natural gas pipelines to install local distribution systems and have them supplied with stored LNG. The formula has been widely used in Asian LNG SPAs, where base price refers to a term that represents various non-oil factors, but usually a constant determined by negotiation at a level which can prevent LNG prices from falling below a certain level. It thus varies regardless of oil price fluctuation. Oil parity is the LNG price that would be equal to that of crude oil on a Barrel of oil equivalent basis. If the LNG price exceeds the price of crude oil in BOE terms, then the situation is called broken oil parity. A coefficient of 0.1724 results in full oil parity. In most cases the price of LNG is less the price of crude oil in BOE terms. In 2009, in several spot cargo deals especially in East Asia, oil parity approached the full oil parity or even exceeds oil parity. Many formula include an S-curve, where the price formula is different above and below a certain oil price, to dampen the impact of high oil prices on the buyer, and low oil prices on the seller. In most of the East Asian LNG contracts, price formula is indexed to a basket of crude imported to Japan called the Japan Crude Cocktail (JCC). In Indonesian LNG contracts, price formula is linked to Indonesian Crude Price (ICP). In continental Europe, the price formula indexation does not follow the same format, and it varies from contract to contract. Brent crude price (B), heavy fuel oil price (HFO), light fuel oil price (LFO), gas oil price (GO), coal price, electricity price and in some cases, consumer and producer price indexes are the indexation elements of price formulas. Usually there exists a clause allowing parties to trigger the price revision or price reopening in LNG SPAs. In some contracts there are two options for triggering a price revision. regular and special. Regular ones are the dates that will be agreed and defined in the LNG SPAs for the purpose of price review. 3 - to allow interchangeability of the gases distributed, via limits on the variation range for parameters affecting combustion: content of inert gases, calorific value, Wobbe index, Soot Index, Incomplete Combustion Factor, Yellow Tip Index, etc. In the case of off-spec gas or LNG the buyer can refuse to accept the gas or LNG and the seller has to pay liquidated damages for the respective off-spec gas volumes. The quality of gas or LNG is measured at delivery point by using an instrument such as a gas chromatograph. The most important gas quality concerns involve the sulphur and mercury content and the calorific value. Due to the sensitivity of liquefaction facilities to sulfur and mercury elements, the gas being sent to the liquefaction process shall be accurately refined and tested in order to assure the minimum possible concentration of these two elements before entering the liquefaction plant, hence there is not much concern about them. Continental Europe, where the acceptable GCV range is quite wide: approx. 39 to 46 MJ/m3(n), i.e. 990 to 1,160 Btu/scf. There are some methods to modify the heating value of produced LNG to the desired level. For the purpose of increasing the heating value, injecting propane and butane is a solution. For the purpose of decreasing heating value, nitrogen injecting and extracting butane and propane are proved solutions. Blending with gas or LNG can be a solutions; however all of these solutions while theoretically viable can be costly and logistically difficult to manage in large scale. C3MR (sometimes referred to as APCI): designed by Air Products & Chemicals, Incorporation. It was expected that by the end of 2012, there will be 100 liquefaction trains on stream with total capacity of 297.2 MMTPA. The majority of these trains use either APCI or Cascade technology for the liquefaction process. The other processes, used in a small minority of some liquefaction plants, include Shell's DMR (double-mixed refrigerant) technology and the Linde technology. APCI technology is the most-used liquefaction process in LNG plants: out of 100 liquefaction trains onstream or under-construction, 86 trains with a total capacity of 243 MMTPA have been designed based on the APCI process. Philips Cascade process is the second most-used, used in 10 trains with a total capacity of 36.16 MMTPA. The Shell DMR process has been used in three trains with total capacity of 13.9 MMTPA; and, finally, the Linde/Statoil process is used in the Snohvit 4.2 MMTPA single train. Floating liquefied natural gas (FLNG) facilities float above an offshore gas field, and produce, liquefy, store and transfer LNG (and potentially LPG and condensate) at sea before carriers ship it directly to markets. The first FLNG facility is now in development by Shell, due for completion in around 2017. Modern LNG storage tanks are typically full containment type, which has a prestressed concrete outer wall and a high-nickel steel inner tank, with extremely efficient insulation between the walls. Large tanks are low aspect ratio (height to width) and cylindrical in design with a domed steel or concrete roof. Storage pressure in these tanks is very low, less than 10 kPa (1.45 psig). Sometimes more expensive underground tanks are used for storage. Smaller quantities (say 700 m3 (190,000 US gallons) and less), may be stored in horizontal or vertical, vacuum-jacketed, pressure vessels. These tanks may be at pressures anywhere from less than 50 kPa to over 1,700 kPa (7 psig to 250 psig). LNG must be kept cold to remain a liquid, independent of pressure. Despite efficient insulation, there will inevitably be some heat leakage into the LNG, resulting in vaporisation of the LNG. This boil-off gas acts to keep the LNG cold. The boil-off gas is typically compressed and exported as natural gas, or it is reliquefied and returned to storage. LNG is transported in specially designed ships with double hulls protecting the cargo systems from damage or leaks. There are several special leak test methods available to test the integrity of an LNG vessel's membrane cargo tanks. The tankers cost around USD 200 million each. Transportation and supply is an important aspect of the gas business, since natural gas reserves are normally quite distant from consumer markets. Natural gas has far more volume than oil to transport, and most gas is transported by pipelines. There is a natural gas pipeline network in the former Soviet Union, Europe and North America. Natural gas is less dense, even at higher pressures. Natural gas will travel much faster than oil through a high-pressure pipeline, but can transmit only about a fifth of the amount of energy per day due to the lower density. Natural gas is usually liquefied to LNG at the end of the pipeline, prior to shipping. Short LNG pipelines for use in moving product from LNG vessels to onshore storage are available. Longer pipelines, which allow vessels to offload LNG at a greater distance from port facilities are under development. This requires pipe in pipe technology due to requirements for keeping the LNG cold. LNG is transported using both tanker truck, railway tanker, and purpose built ships known as LNG carriers. LNG will be sometimes taken to cryogenic temperatures to increase the tanker capacity. The first commercial ship-to-ship transfer (STS) transfers were undertaken in February 2007 at the Flotta facility in Scapa Flow with 132,000 m3 of LNG being passed between the vessels Excalibur and Excelsior. Transfers have also been carried out by Exmar Shipmanagement, the Belgian gas tanker owner in the Gulf of Mexico, which involved the transfer of LNG from a conventional LNG carrier to an LNG regasification vessel (LNGRV). Prior to this commercial exercise LNG had only ever been transferred between ships on a handful of occasions as a necessity following an incident. Liquefied natural gas is used to transport natural gas over long distances, often by sea. In most cases, LNG terminals are purpose-built ports used exclusively to export or import LNG. The insulation, as efficient as it is, will not keep LNG cold enough by itself. Inevitably, heat leakage will warm and vapourise the LNG. Industry practice is to store LNG as a boiling cryogen. That is, the liquid is stored at its boiling point for the pressure at which it is stored (atmospheric pressure). As the vapour boils off, heat for the phase change cools the remaining liquid. Because the insulation is very efficient, only a relatively small amount of boil off is necessary to maintain temperature. This phenomenon is also called auto-refrigeration. Boil off gas from land based LNG storage tanks is usually compressed and fed to natural gas pipeline networks. Some LNG carriers use boil off gas for fuel. Natural gas could be considered the most environmentally friendly fossil fuel, because it has the lowest CO2 emissions per unit of energy and because it is suitable for use in high efficiency combined cycle power stations. For an equivalent amount of heat, burning natural gas produces about 30 per cent less carbon dioxide than burning petroleum and about 45 per cent less than burning coal. On a per kilometre transported basis, emissions from LNG are lower than piped natural gas, which is a particular issue in Europe, where significant amounts of gas are piped several thousand kilometres from Russia. However, emissions from natural gas transported as LNG are higher than for natural gas produced locally to the point of combustion as emissions associated with transport are lower for the latter. However, on the West Coast of the United States, where up to three new LNG importation terminals have been proposed, environmental groups, such as Pacific Environment, Ratepayers for Affordable Clean Energy (RACE), and Rising Tide have moved to oppose them. They claim that, while natural gas power plants emit approximately half the carbon dioxide of an equivalent coal power plant, the natural gas combustion required to produce and transport LNG to the plants adds 20 to 40 percent more carbon dioxide than burning natural gas alone. Natural gas is a fuel and a combustible substance. To ensure safe and reliable operation, particular measures are taken in the design, construction and operation of LNG facilities. In its liquid state, LNG is not explosive and can not burn. For LNG to burn, it must first vaporize, then mix with air in the proper proportions (the flammable range is 5 percent to 15 percent), and then be ignited. In the case of a leak, LNG vaporizes rapidly, turning into a gas (methane plus trace gases), and mixing with air. If this mixture is within the flammable range, there is risk of ignition which would create fire and thermal radiation hazards. Gas venting from vehicles powered by LNG may create a flammability hazard if parked indoors for longer than a week. Additionally, due to its low temperature, refueling a LNG-powered vehicle requires training to avoid the risk of frostbite. LNG tankers have sailed over 100 million miles without a shipboard death or even a major accident. 1944, Oct. 20. The East Ohio Natural Gas Co. experienced a failure of an LNG tank in Cleveland, Ohio. 128 people perished in the explosion and fire. The tank did not have a dike retaining wall, and it was made during World War II, when metal rationing was very strict. The steel of the tank was made with an extremely low amount of nickel, which meant the tank was brittle when exposed to the cryogenic nature of LNG. The tank ruptured, spilling LNG into the city sewer system. The LNG vaporized and turned into gas, which exploded and burned. 1979, Oct. 6, Lusby, Maryland, at the Cove Point LNG facility a pump seal failed, releasing natural gas vapors (not LNG), which entered and settled in an electrical conduit. A worker switched off a circuit breaker, which ignited the gas vapors. The resulting explosion killed a worker, severely injured another and caused heavy damage to the building. A safety analysis was not required at the time, and none was performed during the planning, design or construction of the facility. National fire codes were changed as a result of the accident. 2004, Jan. 19, Skikda, Algeria. Explosion at Sonatrach LNG liquefaction facility. 27 killed, 56 injured, three LNG trains destroyed, a marine berth was damaged and 2004 production was down 76 percent for the year. Total loss was USD 900 million. A steam boiler that was part of an LNG liquefaction train exploded triggering a massive hydrocarbon gas explosion. The explosion occurred where propane and ethane refrigeration storage were located. Site distribution of the units caused a domino effect of explosions. It remains unclear if LNG or LNG vapour, or other hydrocarbon gases forming part of the liquefaction process initiated the explosions. One report, of the US Government Team Site Inspection of the Sonatrach Skikda LNG Plant in Skikda, Algeria, March 12–16, 2004, has cited it was a leak of hydrocarbons from the refrigerant (liquefaction) process system. Jump up ^ "Liquefied Petroleum Gas (LPG), Liquefied Natural Gas (LNG) and Compressed Natural Gas (CNG)". Envocare Ltd. 2007-03-21. Retrieved 2008-09-03. Jump up ^ "SIGNIFICANT EVENTS IN THE HISTORY OF LNG". www.energy.ca.gov. 1 March 2005. Jump up ^ "Atlantic waits on Train 4". Upstream Online (NHST Media Group). 2006-12-06. Retrieved 2008-01-19. ^ Jump up to: a b c Hashimoto, Hiroshi (2011). "Evolving Roles of LNG and Asian Economies in the Global Natural Gas Markets". Pacific Energy Summit. Jump up ^ "The Global Liquefied Natural Gas Market: Status and Outlook". Report #:DOE/EIA-0637. US Energy Information administration. December 2003. Jump up ^ "East Coast LNG project gains momentum, strikes deal with E.ON". The Globe and Mail (Toronto). 2013-06-03. ^ Jump up to: a b c d e f g "A liquid market". The Economist. 2012-07-14. ^ Jump up to: a b Stanley Reed (May 17, 2013). "3 Foreign Companies Invest in U.S. Project to Export Liquid Gas" (blog "Dealbook"). The New York Times. Retrieved May 18, 2013. Jump up ^ JØRGEN RUDBECK. "Analyst: LNG-terminals pressed" (in Danish) "ShippingWatch, 20 September 2013. Accessed: 22 September 2013. Jump up ^ Hughes, Peter (2011). "Europe's Evolving Gas Market: Future Direction and Implications for Asia". Pacific Energy Summit. Jump up ^ "LNG Carrier Leak Test Completed Outside Korea". Oil and Gas Online. January 20, 2009. Retrieved 2009-02-11. Jump up ^ Rankin, Richard (2005-11-14). "LNG Pipe-in-Pipe Technology". Retrieved 2012-06-22. Jump up ^ "LNG: Benefits and Risks of Liquified Natural Gas". Retrieved 2013-02-25. ^ Jump up to: a b c CH-IV (December 2006). Safe History of International LNG Operations. What is LNG and how is it becoming a U.S. energy source? LNG Safety "The Risks and Dangers of LNG" is an exhaustive report prepared by CH·IV International President, Jeff Beale, analyzing the points made in a controversial Anti-LNG video. Prospects for Development of LNG in Russia Konstantin Simonov's speech at LNG 2008. April 23, 2008. The Terrorist Threat to Liquefied Natural Gas: Fact or Fiction? Should America export natural gas to Europe? Where is the boss of BOST? An April Fools’ joke gone awry?